Pseudo Christians who profess to believe the Bible, but deny that it is true (aka Liberals) have always confused themselves and Christians. David Barton is no exception – to being a confused Christian, that is. 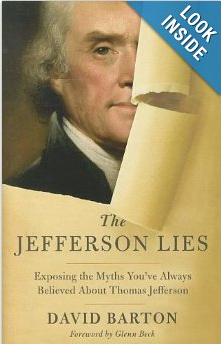 His recent work, The Jefferson Lies: Exposing the Myths You’ve Always Believed About Thomas Jefferson attempts to refute those who claim that Jefferson hated the Bible by pointing to Jefferson’s frequent financial support of efforts to print and distribute Bibles, his lifelong efforts to compile and read various extracts and summaries of the Bible in multiple languages, and his assessment and promotion of Jesus as the greatest moral teacher that ever lived. Compared to the leading atheists of our day who openly denigrate Christ and his Word, Jefferson does appear to be “a horse of a different color.” But is he? The love of God was magnified. When the copyright holders, to their credit, refused to grant permission to use the modified words, the committee reluctantly dropped the hymn. Now both of those statements are true, having strong Biblical support. Had they included the altered version in the hymnal, few could have found any theological errors with their work. But in this case their unwillingness to affirm another foundational truth of scripture exposed their heresy. Heretics and infidels are not what they are because they don’t say anything right. They are heretics because of the wrong things they do affirm or the right things they won’t affirm that are foundational to the gospel. Ask a liberal, “Do you believe the Jonah account is true?" They will typically say yes. Then ask if they believe Jonah was actually swallowed by a fish? A liberal will say no. Other couplets will also work. “Jefferson owned many Bibles, belonged to a Bible society and contributed to it, gave out copies of the full, unedited text of the traditional Bible, and assisted in publishing and distributing Bibles. In each of these situations, Jefferson had the opportunity to indicate his personal displeasure with the Bible or at least refrain from participating, but he did not do so.” [Emphasis in original] p69. But in his short chapter defending Jefferson’s view of the Bible, he never tells us about the fundamental statements that Jefferson won’t affirm or of his blatant denial of Christ’s deity. Let’s take a look at a few of these statements from his own letters. There are, I acknowledge, passages not free from objection, which we may, with probability, ascribe to Jesus himself; [In other words, denying that the whole Bible is the word of Christ, Jefferson even finds some of Christ’s own words objectionable. -PA] but claiming indulgence from the circumstances under which he acted. His object was the reformation of some articles in the religion of the Jews, as taught by Moses. That sect had presented for the object of their worship, a being of terrific character, cruel, vindictive, capricious and unjust. [This is pure blasphemy on Jefferson’s part calling the just and righteous God cruel, vindictive, unjust. -PA] Jesus, taking for his type the best qualities of the human head and heart, wisdom, justice, goodness, and adding to them power, ascribed all of these, but in infinite perfection, to the Supreme Being, and formed him really worthy of their adoration. Letter to William Short, Monticello, August 4, 1820, Vol 19 p13. But the greatest of all the reformers of the depraved religion of his own country, was Jesus of Nazareth. Abstracting what is really his from the rubbish in which it is buried, easily distinguished by its lustre from the dross of his biographers, and as separable from that as the diamond from the dunghill, we have the outlines of a system of the most sublime morality which has ever fallen from the lips of man; outlines which it is lamentable he did not live to fill up. Epictetus and Epicurus give laws for governing ourselves, Jesus a supplement of the duties and charities we owe to others. The establishment of the innocent and genuine character of this benevolent moralist, and the rescuing it from the imputation of imposture, which has resulted from artificial systems, (*) invented by ultra-Christian sects, unauthorized by a single word ever uttered by him, is a most desirable object, and one to which Priestley has successfully devoted his labors and learning. It would in time, it is to be hoped, effect a quiet euthanasia of the heresies of bigotry and fanaticism which have so long triumphed over human reason, and so generally and deeply afflicted mankind; but this work is to be begun by winnowing the grain from the chaff of the historians of his life. [Who are the historians of his life – Matthew, Mark, Luke, and John to begin with. - PA] I have sometimes thought of translating Epictetus (for he has never been tolerable translated into English) by adding the genuine doctrines of Epicurus from the Syntagma of Gassendi, and an abstract from the Evangelists of whatever has the stamp of the eloquence and fine imagination of Jesus. Letter to William Short, with a Syllabus, Monticello, October 31, 1819, Vol 19, p11. What are the artificial systems invented by ultra- Christian sects from which the historical Jesus needs to be rescued? We don’t have to guess. He lists them himself at the end of the paragraph. They include (*) the deity of Christ, the creation of the world by him, his miraculous powers, his resurrection and visible ascension, the Trinity, original sin, atonement, regeneration, and election to name a few. In Biblical terms Jefferson was an antichrist in that he denied that Jesus was the Christ and that he was God in the flesh. 1 John_2:22 Who is a liar but he that denies that Jesus is the Christ? He is antichrist, that denies the Father and the Son. 1 John_4:3 And every spirit that confesses not that Jesus Christ is come in the flesh is not of God: and this is that spirit of antichrist, whereof ye have heard that it should come; and even now already is it in the world. 2 John_1:7 For many deceivers are entered into the world, who confess not that Jesus Christ is come in the flesh. This is a deceiver and an antichrist. Paul said that if Christ be not raised our faith is in vain. If Christ is not God, he died in vain. Those who don’t believe the Trinity are to be anathematized according to the Council of Nicea (325AD). To deny all these truths about Christ makes one an infidel. Jefferson was an infidel like many liberals who filled the pulpits of the 20thcentury churches and signed documents like the AuburnAffirmation of 1924. They studied the Bible, but rejected it message and its Savior. These are dangerous people in that they might appear to many to be sheep, they are, in fact, wolves seeking to destroy the church of Jesus Christ. Yet despite all these clear statements, Mr. Barton inexplicably states that "there was never a time when he was anti-Jesus or when he rejected Christianity." p167. If the denial of the resurrection, the Trinity, the Incarnation, and Christ's eternal pre-incarnate existence isn't a denial of Christianity, I don't know what is! Mr. Barton, what do you think Christianity does believe? It is true that Thomas Jefferson faced many trials, including losing his wife at a relatively young age. But that is not an excuse for denying God. A Christian will ultimately persevere through the trial by the grace of God. It is also true that Jefferson said many good things, even things that might appear to indicate that was a Christian. But one must remember, heresy is often more defined by what people will not affirm than by what they do affirm. Also it is not uncommon even today for politicians to "speak like a Christian" in order to appeal to the masses. But even some of the "better" thing he said indicate he believed a false gospel. For example, in a letter to Salma Hale on July 26, 1818, he wrote, "[I]t is only by ... getting back to the plain and unsophisticated precepts of Christ that we become real Christians." This, or a variation of it, is common liberal notion. But it is not the gospel of Jesus Christ. It is a false gospel that has deceived many, sending them to eternal judgment under the wrath of God. We are not saved by getting back to the simple precepts of Christ. Precepts are laws. Laws don't save anyone. We are saved by faith in Christ. Keeping the golden rule may make many think they are good people, but God's word says otherwise. Jefferson may have thought of himself as a Christian because he was a disciple of the doctrines of Jesus. But as we have seen, he denied all the important, foundational doctrines of the gospel. He was a disciple of a god of his own making, not of the historical Jesus who was made flesh and dwelt among us. He may have believed in god, but it wasn't the Triune God of the Bible. The evidence in Jefferson's own words is clear. Contrary to what Barton writes, "...but what cannot be questioned is the fact that throughout his life, Jefferson was pro-Christian and pro-Jesus in his beliefs, demeanor, and public endeavors" (p192), Jefferson was an infidel. This fact is not altered one bit by the fact that there were many churches teaching similar false doctrine to what Jefferson believed. Even if everyone in the entire world is teaching a lie, God word is still True. Mr. Barton, please stop promoting an infidel heretic as "pro' Christ and "pro" Christian. You are spitting in the face of your Savior and Redeemer, Jesus Christ.